This was everything Spurs’ fans had hoped for from our new manager, an awesome display of football the Pochettino way. Last week the new Tottenham boss set about putting right last season’s wrongs, gaining some revenge for our three defeats to West Ham. Here he laid to rest another White Hart Lane ghost, as his side destroyed former Spurs manager, Harry Redknapp’s QPR. The visitors went with their new Hoddle inspired back three, which seemed a strange decision. It is a formation well known to match up poorly against a single striker in front of an attacking and mobile midfield. Either the three centre backs are wasted marking the lone frontman, or they get pulled around by the midfield runners. These problems were compounded by Dunne and Ferdinand’s lack of mobility. Spurs capitalised ruthlessly. 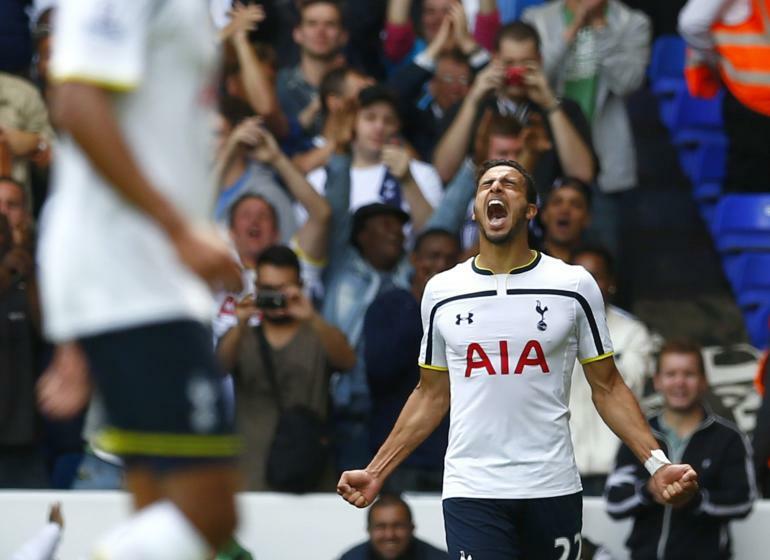 The day began with a surprise – a start for Nacer Chadli. Elegant and technical, while built like a tank, he has all the physical attributes you could wish for. Nevertheless last year he was ineffectual, leaving some of us questioning what he contributes to the side. Within 12 minutes we had an answer, as he opened the scoring. Chadli was a revelation, finishing two goals and having a hand in a third. Alongside him, Eriksen was full of nice passes and clever runs, but it was Lamela who took the man of the match award. This was the game where the £30 million man finally arrived, terrifying the QPR defence with his direct runs. If Lamela was the star, Capoue was the rock on which this performance was built. Dropping between the centre backs to create our own back three, he constantly thwarted opposition attacks. With 121 passes, more than half as many again as the next highest, he was the engine room in midfield. Dier was excellent again, adding a headed goal to his winner from last week. He looks a brilliant signing. Even Danny Rose had a great game. With a clear set of instructions and plenty of protection, Pochettino has managed to harness Rose’s chief weapon – pace. Whereas last week’s performance was gritty but unremarkable – an anticlimax after the pre-season hype – here was a team clearly in the manager’s image. The change from last year was quite remarkable. What really stood out was the teamwork. There was a clearly defined plan and everyone new their part in it. When not in possession, Spurs hunted in packs, pressurising QPR into mistakes. Often one player would make the initial challenge, then another would take the ball. Once in possession, Spurs counter-attacked with lightning speed, each break joined by multiple teammates making runs past the ball carrier, giving him several options and dragging the struggling QPR defence all over the place. It reminded me a bit of rugby – men either side supporting the man in possession, taking angles, making decoy runs. At times Spurs would pause for breath, maintaining possession by passing the ball around in their own half, but even this was crisp one touch stuff, moving the ball from side to side at speed. Not giving the opposition a chance to settle. This was all in marked contrast to last season where the passing was slow and the movement non-existent, invariably ending with the ball at the keepers feet, ready for another hopeful punt downfield. Gone was the disorganised rabble of Tim Sherwood. Gone was the slow, predictable metronome of Andre Villas-Boas. There were a few scares near the end, as Zamora and Loic Remy had chances but at that point you could forgive the Tottenham players their lack of concentration. I realise it’s just one game and that QPR were poor. Next week against Liverpool will be a very different proposition. But it looks like we’re getting somewhere, already, and at this stage that’s good enough for me. Let me know your thoughts on the match in the comments below. This entry was posted in Match Reports and tagged Eric Lamela, Etienne Capoue, Harry Redknapp, Match Report, Mauricio Pochettino, QPR, Spurs, Tottenham Hotspur on August 25, 2014 by Jon @ AnythingButPenalties. Joke aside, what a team performance! Other than the players you already mentioned, I would like to give a shout-out to Verthonghen. Seeing him back to his old self (composed, elegant and dominant) was refreshing. There were so many great performances, it was hard to mention them all. I totally agree, Vertonghen was very good. He is such a talented player, I really hope we can get him to sign a new contract.